WASHINGTON — The Trump administration on Thursday proposed sweeping new rules that could make it easier for small businesses to band together and create health insurance plans that would be exempt from many of the consumer protections mandated by the Affordable Care Act. As many as 11 million Americans “could find coverage under this proposal,” the Labor Department said in issuing the proposed rules, which carry out an executive order signed by President Trump on Oct. 12. The public will have 60 days to comment on the proposal before the Trump administration adopts final rules with the force of law. The proposal would allow small business owners, their employees, sole proprietors and other self-employed people to join together as a single group to buy insurance in the large-group market. The new health plans could be exempt from some requirements of the Affordable Care Act. They would, for example, not have to provide certain “essential health benefits” like mental health care, emergency services, maternity and newborn care and prescription drugs. But consumer groups, state officials and Blue Cross and Blue Shield plans have strenuously opposed similar ideas for years. Association health plans, they say, will tend to attract employers with younger, healthier workers, leaving behind sicker people in more comprehensive, more expensive plans that fully comply with the Affordable Care Act. That could drive up premiums, which already have risen steadily as Republicans have taken aim at President Barack Obama’s signature domestic achievement. Similar health plans have a history of fraud and abuse that have left employers and employees with hundreds of millions of dollars in unpaid medical bills. Marc I. Machiz, who investigated insurance fraud as a Labor Department lawyer for more than 20 years, said the proposed rules were an invitation to more scams. But two influential trade groups that could potentially sponsor the new health plans, the National Restaurant Association and the National Retail Federation, welcomed the proposed rules. 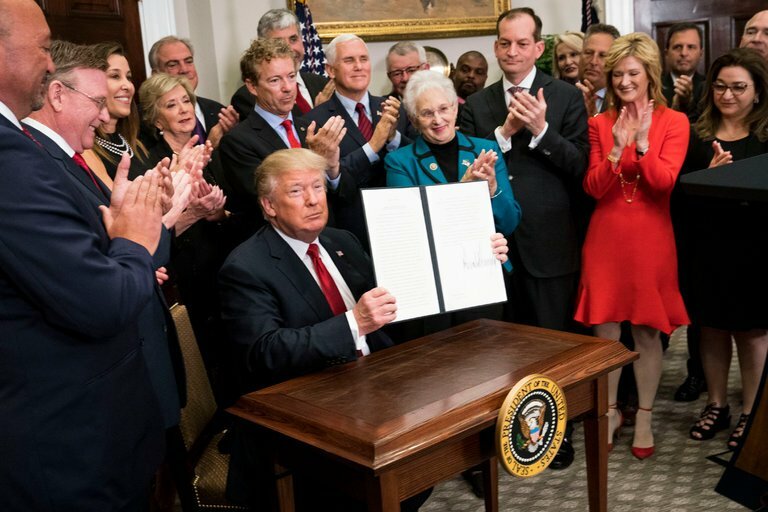 The proposal deals another blow to the Affordable Care Act just two weeks after Mr. Trump signed tax legislation that will eliminate penalties for people who go without health insurance. Republicans in Congress have been trying for two decades to promote association health plans through legislation. The House passed a bill that included such plans in 1998, but it died in the Senate. President George W. Bush proposed them in 2003 and 2004. The House passed a bill to encourage them last March. And Senator Rand Paul, Republican of Kentucky, has championed a similar bill in the Senate. Now the Trump administration says it will use its regulatory authority to accomplish what Congress could not. The proposal offers a new interpretation of “employer” and other terms in the Employee Retirement Income Security Act of 1974, the framework for employer-sponsored health plans covering tens of millions of Americans. Mr. Trump had ordered the Labor Department to develop the rules as a way to provide insurance options for consumers and small businesses that he said would cost less because they would be “exempt from the onerous and expensive insurance mandates” in the 2010 health law. In response to critics, the Trump administration said that its proposal included some protections for consumers: “Small business health plans (association health plans) cannot charge individuals higher premiums based on health factors or refuse to admit employees to a plan because of health factors,” such as a physical or mental illness, disability, claims history or genetic information. The rules would expand the types of groups that could form association health plans and would allow for membership across state lines. Employers around the country could, for example, band together if they were in “the same trade, industry, line of business or profession” but had no other connections to one another. Likewise, employers in the same state, region or metropolitan area could form a group health plan. For many years, the department has required a much greater “commonality of interest” among small businesses that wanted to be treated as a large group when buying insurance. William G. Schiffbauer, a lawyer who specializes in insurance and employee benefits, said Thursday that the rules would “overturn years of advisory opinions from the Labor Department.” If the agency adopts this proposal as a final rule, he said, “it will very likely be challenged in the federal courts, delaying implementation” and shifting attention back to Congress. The rules would make new insurance options available to “the millions of uninsured Americans who are sole proprietors or the family of sole proprietors,” the department said. Under the rules, association health plans could buy commercial insurance or serve as their own insurers, paying claims directly from the plan’s assets. Some people who now obtain coverage in the Affordable Care Act marketplace could instead join association health plans. In an interview last week with The New York Times, Mr. Trump suggested that the new policy had been put into effect, but that is not the case. The department said it now had the authority to prevent such abuses. But former employees said the department’s enforcement apparatus had been weakened by budget cuts and could not adequately police compliance.